The culture, contributions and constitutional firsts of the Metis people are being recognized as Alberta’s eight Metis Settlements mark 80th anniversary. 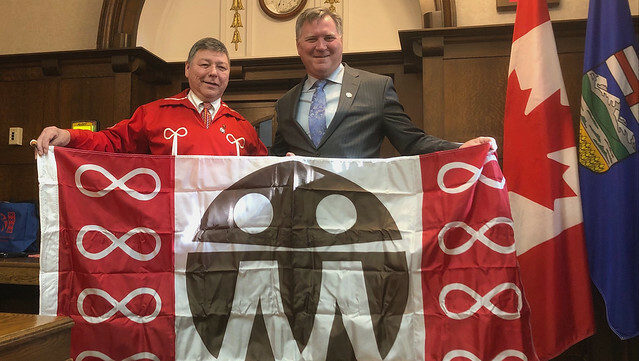 Gerald Cunningham, president of the Metis Settlements General Council, and Indigenous Relations Minister Richard Feehan celebrate 80th anniversary. To honour Alberta’s commitment to a renewed relationship with Indigenous communities and mark eight decades of history between the Government of Alberta and the Metis Settlements, Indigenous Relations Minister Richard Feehan and Gerald Cunningham, president of the Metis Settlements General Council, joined leaders of the eight Settlements to celebrate this milestone. Since the creation of the Metis Population Betterment Act in 1938, which formally established Metis Settlements, Alberta has been a national leader in recognizing the unique status of Metis people. Alberta remains the only province in Canada with a dedicated Metis land base and unique governance structure entrenched in provincial legislation. The Metis Settlements General Council celebrates “The Big Five”: Joe Dion, Peter Tompkins, Malcolm Norris, Jim Brady and Felix Callihoo. The work of these men created the foundation for a Metis homeland in the Metis Population Betterment Act of 1938. This vision was continued by the Alberta Federation of Metis Settlements, formed in 1975 by the “Fathers of Federation”: Adrian Hope, Maurice L’Hirondelle, Lawrence Desjarlais, Sam Johnston and Richard Poitras. The federation created a relationship between Alberta and the Metis Settlements that resulted in provincial legislation proclaiming the independence to self-govern and self-determine. The Government of Alberta continues to work closely with the Settlements and the General Council on Alberta’s seven Indigenous climate leadership programs, which help Settlements create jobs, lower energy costs and transition to a greener economy. The Settlements and the General Council have received more than $7 million from these and other economic development programs since 2015. This includes more than $1 million for new solar photovoltaic projects. With over 114,000 Metis people living in the province, Alberta is home to the second-largest Metis population in Canada. Eight Settlements are established by the Metis Settlements Act : Buffalo Lake, East Prairie, Elizabeth, Fishing Lake, Gift Lake, Kikino, Paddle Prairie and Peavine. Each is run by a five-person Council that is elected by the membership and headed by a chairperson selected by the Council members. The General Council was established by the Metis Settlements Act. It is comprised of the elected councillors of all of the Metis Settlements and a four-person executive who are elected by the councillors.